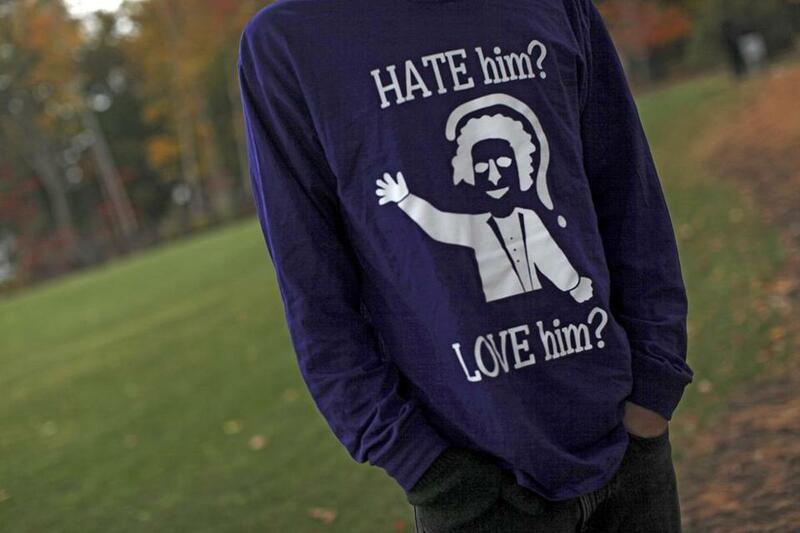 A student wore a shirt that references the controversy over Amherst College&apos;s Lord Jeff mascot. The long, controversial reign of Lord Jeff as Amherst College’s unofficial mascot could be coming to an end. Amid student protests at the elite private school and other campuses calling for racial and social reforms, a group of faculty voted this week to endorse dropping the symbol, given the besmirched reputation of its namesake. Lord Jeffery Amherst, who commanded British forces in North America during the French and Indian War, is believed to have endorsed giving blankets containing the smallpox virus to Native Americans. A college spokeswoman said Wednesday the faculty meeting was not official and “as such, [the vote] was nonbinding.” The college’s trustees expect to “take this information into account at their meeting in January,” said the spokeswoman, Caroline Hanna. The move to dump the lord appears to be gaining momentum as racial tensions heat up on campuses across the country. The protests have been prompted in large part by racial tensions at the University of Missouri last week. Amherst does not have an official mascot. But the figure of Lord Jeff, who wears a red coat and powdered wig, has been the unofficial symbol since a student wrote a song about him for the glee club in 1906. Martin visited with the protesters and met with student organizers. On Sunday, in a letter to the college community, she commended students for speaking out but explained why she believed responding to the demands would be counterintuitive. Instead, she provided a list of eight commitments aimed at more campus diversity and opportunities for conversation among people from different backgrounds. There have been various efforts to change the Amherst mascot to a moose, after one wandered into Martin’s backyard last year, or Sabrina, a statue of a nymph that students use for pranks on campus. One alumnus, Sam A. Mawn-Mahlau, a 1983 graduate, said that in his day, students made fun of Lord Jeff more than anything. “I don’t think Lord Jeff was for any of the students much of a serious sort of piece of our identification. It was simply a sort of humorous if somewhat problematic symbol,” Mawn-Mahlau, an attorney in Boston, said Wednesday. He said the mascot should be a penguin, since alumnus Burgess Meredith played the aquatic arch-villain in the 1960s Batman television series and movie. 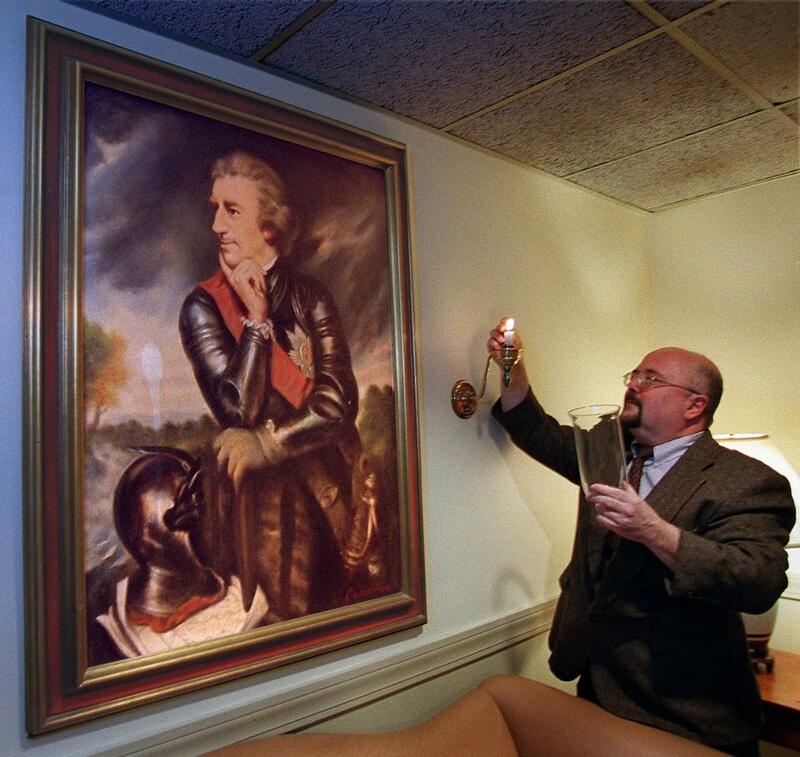 Michael Maderia, general manager of the Lord Jeffrey Inn in Amherst, lit a candle next to a painting of Lord Jeffrey Amherst.